25% decrease as well in 'Jewish nationalist' crime. Is it due to the war, or something else? "Price tag" vandalism attacks by "right-wing extremists" against Palestinian Arabs have decreased 45% since 2013, Channel 2 reports Friday. While in 2013 were 92 reported incidents of vandalism and sabotage against the Palestinian Arabs, in 2014 there were 51 such cases, according to the news channel. In addition, crimes labeled as "Jewish nationalist crimes" - including cases of "mutual violence" between Israeli Jews and Palestinian Arabs, as well as resistance against IDF and security forces in Judea and Samaria - have decreased by some 25%. In 2013, there were 420 crimes reported under this label, opposed to just 314 in 2014. The change is due to Operation Protective Edge in Gaza, one Central Command officer claims. "During the operation, there was solidarity with the IDF, and that has caused fewer incidents of this kind," the officer said, noting that there was one such incident of resistance against the IDF in June and none whatsoever in July and August. But Binyamin Regional Council head Avi Roeh disagreed. "You cannot say that there is a 'magic pill' that prevents these events," he said. He cited a number of factors, including the decline in IDF raids in general and some educational influence across 1949 Armistice lines. 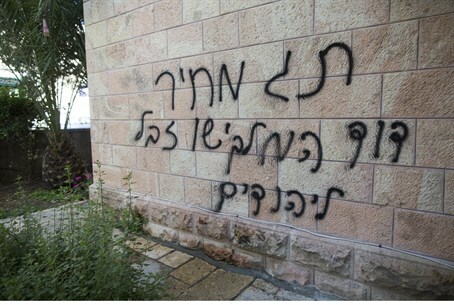 "Price tag” is a euphemism for vandalism and other forms of criminal damage committed against Arab property by Jewish extremists, usually in revenge for terrorist attacks but sometimes also in response to the eviction of Jews by security forces. On a handful of occasions, however, Arab provocateurs have also staged such attacks to provoke a response by authorities against neighboring Jewish communities. In 2014, a resident of Samaria documented local Arabs cutting down olive trees and painting "price tag" graffiti on the severed trunks.